When preparing for a revision total hip arthroplasty (THA), the surgeon’s “wish list” for the femoral side typically includes good exposure, efficient component and cement removal, and ease of component insertion. All of these can be facilitated by an extended trochanteric osteotomy (ETO) when performing THA through a posterior approach, according to Wayne G. Paprosky, MD, from Rush University Medical Center in Chicago, Illinois. Dr. Paprosky shared his thoughts on ETO at ICJR’s 6th Annual Revision Hip & Knee Course in Rochester, Minnesota. An ETO is most commonly done after dislocation of the hip, before stem removal, but it can also be done prior to dislocation in patients with scarring, abundant heterotopic ossification, or subsidence. 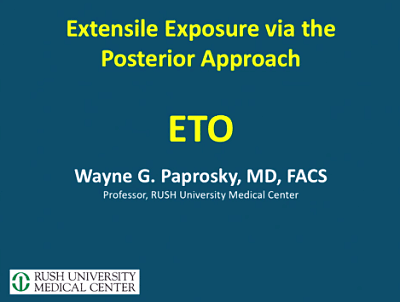 Dr. Paprosky noted that an ETO can also be done after dislocation and after stem removal, but this is currently less common because fully porous-coated stems are less likely than older, cemented stems to loosen. Click the image above to watch Dr. Paprosky’s presentation from ICJR’s 6th Annual Revision Hip & Knee Course. Dr. Paprosky has disclosed that he is a consultant for and receives royalties from Stryker and Zimmer Biomet and that he is a consultant for Intellijoint and Medtronic-Salient.